Before I start today's post I must give a quick shout out to my friend Mark Koopmans over at Aloha! He's running 'Got Green?' a blogfest in honour of St Patrick's Day. Sign ups began today but you have until the 16th to join in, before sharing your memories, dreams, or complete fiction about the Emerald Isle on the 17th, the day itself. Full details are here. Therefore, I'm very pleased (and more than a little nervous) to announce that Musical Stories has been replaced by Musical Impressions. Thank you to Golden Eagle at The Eagle's Aerial Perspective for the name. As soon as she suggested it I knew it was perfect. Here is how it's going to work. 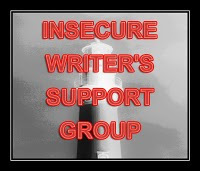 I'd love it if you could email me a pitch, outline, synopsis, blurb, or whatever you prefer for one of your stories. This can be something you're working on, something that's finished or even something you just made up ten minutes ago. Every Friday, I'll take one (in the order they arrive) and select a song that I think matches your plot, theme or mood. They may not be 'exact matches', just something I think your work reminds me of. You'll have a choice as to whether you would like your work critiqued or not, and whether you would like to remain anonymous, just let me know in the email. I'm going to run this for the three Fridays left in March and decide what to do from there (in other words, if it's really really hard, I might have to think of something else!). I hope this is clear, if not feel free to drop me an email or a comment. Also, this is an idea in progress so if you have any suggestions feel free to voice them. And someone, please send me something or I'm going to feel really silly! Ok, that sounds awesome. I'll have to pull together my synopsis. Why are they the hardest to write? Oh, I so want to do this! Awesome idea! I am, of course, an idiot. You have joined in - and I already have some ideas as to what I might pick for next week. Sorry Jaycee! What a neat idea! Looking forward to seeing the results! This is a really fun idea. I will have to get working on the synopsis anyway - would love to see what it prompts musically. I cannot wait for the new project that you will be starting. By the way what do you think about "wrapped around your finger" is about? I thought that it was about a servant but a friend of mine thinks that it is about a married person. I think it's about an older woman having an affair with a younger man who adores her, but then one day the tables are turned and she realises she cares for him more than he cares for her, as he tells her he will leave her with no more than a beautiful memory. As ever though, I firmly believe that lyrics - like stories - mean whatever you want them to mean. I can't wait to see what you come up with, Sarah. What a cool idea! Ha ha Sarah. I really can just see you thrashing about writing up synopses to post your musical choices to. I hope it doesn't come to that. Looking forward to reading the first! D.
I love it! How fun!! Thanks Emily, I hope you like what I choose! Great idea - i"m going awol soon, but will have a go when I get back. I'm looking forward to seeing this! It's going to be great. That's a really cute idea! And a great name, too! 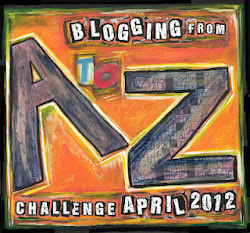 I saw your blog link on the A to Z Challenge and stopped over. 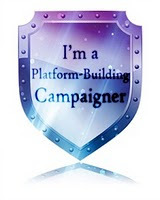 I'm now following!! man this is going to be cool. also, i love that you struck out the empty in your blog header! This looks to be a fun twist on your Musical Stories, looking forward to seeing your musical interpretations. I'm intrigued. Looking forward to seeing how this plays out. Have fun with it! This sounds cool. I'd like to see what kind of music you'd pick out for a scene with some of my characters. It could be either totally awesome or a total surprise as in, "I'd never have picked that!" In either case, I'll get a kick out of it. Sounds like fun, I'll be coming bak. To see what you come up with. Sounds like a great idea I can't wait to see them. Sarah...thank you so much for your kindness after our loss. Our furry pup is greatly missed but thoughtful friends like you go a long way in healing our hearts. Oh no need to thank me at all Sush. Losing a member of the family is heartbreaking. I hope you're coping okay. Hugs to you. This sounds like fun. I'll have a think about something to send your way! Thanks for the kind words, and the award. I'm sorry I'm running so behind and am only now responding! This sounds like a very unique and fun idea. I'll have to be watching for upcoming submissions. Thanks Arlee, hope you find something to enjoy! This is a fun idea. I always love your Friday songs but I usually look at work and can't listen to ALL the songs, so this will work out perfect. I can't wait to hear what you come up with. Wow, what a GREAT idea! I'm very heavily inspired by music and I would love to see what you think of my synopses. Gotta email you soon!